Imagine your brand being seen during the most prolific shopping cycle of the year and known for providing free Horse-Drawn Holiday Wagon Rides in Downtown Bend. For nearly a decade, Horse-Drawn Holiday Wagon Rides have been a cherished tradition that attract thousands of people from all over Central Oregon. Best of all, your role in making the event possible will be seen as a huge holiday greeting card to the community. During the rides that Cowboy Carriage has given in the past, we have collected thousands of dollars in tips and donations. At the end of the Holiday Wagon Rides, the money was donated to the Kid’s Center, a child abuse intervention center in Bend. We will continue to support this worthy charitable organization that provides an immeasurable benefit to our community and your sponsorship will make this possible. We are pleased to provide your company with an outstanding experiential marketing opportunity to become a sponsor of the Holiday Wagon Rides in Downtown Bend. Sponsorship will provide a tremendous marketing and communication platform, before a projected 150,000 people. Our premium sponsors will be recognized in their role of making free Holiday Wagon Rides possible during our radio advertising campaign. The advertising will run over a 6 week period starting the week before Thanksgiving. Combined Communications has projected that the campaign will reach over 70,000 people spread over three of their most popular radio stations. While making loops through Downtown Bend our horses, adorned with brass bells, will be drawing bystander’s attention to the banner on the sides of our wagon. It will be advertising free wagon rides provided by our sponsors. The same wagon and banner will also be used for the Bend Christmas Parade which, in a 2016 Bend Bulletin article, was estimated to draw approximately 5000 attendees. We will be using part of your sponsorship dollars to place ads, which will include your logo, targeting local shoppers. Print ads will be run in The Source Weekly in each of the six issues during the holiday season, the October, November and December editions of Cascade A&E Magazine and in Cascade Business News from October through December, reaching over 75,000 people. These advertisements will highlight your contribution and generosity to Central Oregon. Our Visit Bend campaign is specifically targeting holiday tourism by mentioning the free wagon rides in promotions targeted along the I5 corridor. The entire wagon ride schedule will be on Visit Bend’s free listing calendar and also in paid featured event slots in three different activity sections on the Visit Bend website. Links to your website on our Visit Bend Enhanced Listings. While riding in the wagon through downtown our passengers are led in singing Christmas carols, which they choose from our Christmas caroling book. While the parents are assisting the children to find the words for Frosty the Snowman and Rudolph the Red-Nosed Reindeer, they will notice your advertisement incorporated between the songs. After their ride, they will be drawn to take advantage of your specials or coupons in the advertisement. Christmas caroling books will be promoted in radio and in print ads, as well as be available for download. We will be printing 5,000 copies that will be distributed throughout Central Oregon. In all print and radio advertising, people will be instructed to find the details of the rides and to download their copy of the Christmas caroling book on our website. Your advertisements will also be listed on the Cowboy Carriage website, linking to your homepage. Press releases will be sent to all major news publications in Central Oregon. Sponsors will be listed as the providers of the free Holiday Wagon Rides. Sponsorship of the Holiday Wagon Rides is an amazing branding experience to be showcased throughout Central Oregon during the 2018 Holiday season. Your involvement in this cherished tradition will make this event sustainable for years to come. The Holiday Wagon Rides staff is dedicated to the success of our sponsors and will go above and beyond to make the most of your involvement. Contact Ryan to take advantage of these opportunities to bring people into your location during the Holiday Season! I wrote this article for a wedding magazine that decided to not use it. I’m not going to let it go to waste so I am publishing it here. Cowboy Carriage offers a variety of horse-drawn carriage and wagon services specifically for weddings. First, our horses Kurt and Roman are a matched pair of dapple gray Percheron that are 19 hands (Four inches short of the current world’s tallest horse) and around 2,200 pounds apiece. Beau is an 18 hand Percheron but, he is all black and nearly as heavy. They look sharp dressed in their gloss black harness. Next, our carriage and wagons. The carriage is a vis-a-vis (face to face). It is black with white pin stripes and white leather interior. It was special ordered specifically to be used in weddings and is one-of-a-kind. We thought a white carriage would mask the details of a bride’s dress and colored seats may clash with wedding colors. If the weather is being uncooperative, we can put the top up to keep the bride’s hair looking fabulous. The carriage seats four adults comfortably, maybe six, and a little flower girl looks cute up in the front with the driver. Our small wagon seats six and is perfect for transporting the bridal party to the ceremony and giving rides to guests afterward. The carriage and small wagon can be pulled by one or two horses. The large wagon holds up to 20 adults hay-ride style. We use it for pumpkin patch rides, festivals and our horse-drawn brewery tours in Bend which are excellent for bachelor/bachelorette parties. We start those before lunch and spend five hours touring and sampling at Bend’s best watering holes. We finish early so we can get the boys home for dinner. A 2,200-pound hangry horse is not a sight you want to witness! Plus, it gives the opportunity for the guys and gals to go on the tour together and still have time to do their own thing in the evening. It’s also a fun activity for guests from out of town. If a party books a wedding and brewery tour together, we give a significant discount to the bride and groom for their wedding. Arriving in our carriage makes an entrance fit for princesses that will make even your mother-in-law cry. If that sight isn’t enough reason to hire us, there is another reason to have our horse and carriage at your wedding. We make a perfectly smooth transition between the ceremony and reception. If the two events happen at the same location, when the bride and groom leave the ceremony they will be the first people to the reception! How about a romantic carriage ride in between with a stop for pictures and some time alone before you spend the rest of the day with family and friends? This gives time for everyone to move to the reception and you have the opportunity for another grand entrance! We are located just east of Bend and do most of our work in Central Oregon, but can travel anywhere in Oregon for weddings or special events. We work in Salem at the state fairgrounds for Ag Fest, at Olson Farms Pumpkin Patch in Damascus in October and you can find us all summer long giving rides in downtown Bend. Give us a call and we can set you up with a wedding experience that will still be talked about on your 50th anniversary. Here are a few photos of Kurt and I that were taken at a First Friday Art Walk this summer. Thanks to Erik Ellingson for sending me the pictures! Before treating mom to a spectacular brunch at the Pine Tavern, you could make up for all of those days when she folded your laundry for you, by taking her on a carriage ride around downtown Bend. Valentines Day is about romance and treating your loved one extra special. 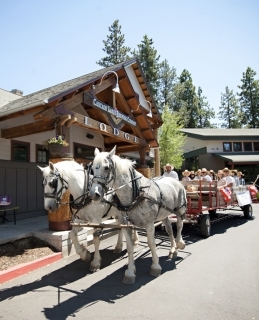 There is nothing more impressive than a carriage ride through Bend! Bring your Valentine and meet us on the corner of Bond and Minnesota for your ride. Or, I can pick you up at a restaurant in downtown but have to subtract 10 minutes from the ride to allow travel time. If you would like to do this, during checkout, you MUST put the information in the place for special instructions. Half hour carriage rides go through downtown and a short jaunt through the historical district and back through downtown. Click on an available time to start the reservation process. Thank you so much for writing us a review. It help tremendously for people to find Cowboy Carriage when they are searching the internet for fun things to do in Bend, Oregon. I hope you enjoyed your experience with Cowboy Carriage! I wanted to do something fun for the 4th of July Pet Parade in Bend. Last year I rode big Dan through the parade by myself, but this year I wanted to bring my boy, Mason with me. Rather than ride Kurt, I decided on something a little more out of the ordinary. He is used to pulling already so I thought that Mason’s Radio Flyer stand out. What do you think? Making friends before the parade. Lined up and ready to roll! Kurt makes it look like he is pulling such a heavy load! Maybe next year we can tie some more wagons on behind ours. Anyone interested? If it sounds like something you would be interested in doing with your children, sign up for our mailing list and like us on Facebook. Fans are first to join in the fun. Roman in the front and Kurt in the back. Decked out and ready to perform! Since Dan and Saucer are 23 and 21 years old, I have looked for a new team for a few years. They are in great shape and can still work, but I don’t want to overwork them. On the other hand, I believe that horses aren’t meant to just stand in a pasture and eat, especially when they are older. I compare it to tying you to a couch and feeding you nothing but Doritos. Now they will be backups for pulling the wagon and can pull the carriage in downtown Bend enough to stay healthy. Saucer will probably still pull the carriage for weddings also since he is so darn good looking! It just so happens that I had heard that Valley View Percherons, owned by the Wilder family from Custer, Washington, were retiring from showing and were selling their horses. This is the same farm that my uncle Jeff bought Dan and Saucer from 15 years ago! The Wilders sold 17 horses last year and were finishing their shows this year before selling their last few. The last show of the season was at the Washington State Fair in Puyallup. Since it saved me about 6 hours round trip through Seattle I picked them up after the last day of the fair. Hitched up and ready to go. Kurt and Roman are the wheel horses (back). In order to put on a show with 6 horses it takes a whole crew to get everything done. The Wilders had three young ladies that have helped with the horses for a few years and wanted to say good-bye. They said the horses had never been ridden before and the girls wanted to give it a try. After the horses and people had dinner we all met back at the barn to have some fun! Cody didn’t mind Amber on his back at all! Mr. Wilder bet Amber she couldn’t braid his tail from his back. Looks like Amber won the bet! Kurt was Rachel’s favorite. She said he was the easiest horse she has ever broke! Brave girls. Their butts are 6’4″ off the ground on animals that weigh 2200 lbs and had never been ridden before! Mt. Ranier on the way home. After we were over the mountains and headed toward Yakima I let the boys out of the trailer. We went for a short walk and had some water in a stream. Before you start seeing Kurt and Roman pulling the carriage we need to get used to working with each other. They can handle crowds and distractions proven by their experiences showing with Valley View Percherons, but can they handle a First Friday Art Walk? Dan and Saucer know and trust me. I will start building a working relationship with Kurt and Roman at Olson Farms Pumpkin Patch in October. Their debut in Bend will probably be the Veteran’s Day Parade on November 11th. For now, they are getting lots of love and attention at their new home. I hadn’t planned on riding my 18 hand, 2200 lb. Percheron through the Bend Pet Parade, but I am glad I did! It is the second time that I know of that he has been ridden in in 15 years and he didn’t complain a bit. I had ridden him earlier this February after he pulled my son and I on a sled. For this parade I climbed on him using the horse trailer for a ladder and was afraid to jump off because I didn’t know how I would get back on! After over an hour on his back I was so ready to dismount. He is easy to ride but very uncomfortable. Dan is so wide it is like trying to wrap your legs around your kitchen table! We were even on the news! There is a flash of us going by the camera at about 50 seconds in after the part about the pancake breakfast. Next year I want to make a train of Radio Flyer wagons full of kids and have Dan pull us while I drive him from the front wagon! Dan and I are out in front of the Deschutes Historical Museum waiting for the Pet Parade. We have 8 seats available on a HORSE DRAWN BREWERY TOUR happening on Sunday, May 25. MEMORIAL WEEKEND! May 23rd kicks off Central Oregon Beer Week. What better way to join in on the fun happening at the breweries than to visit them with us! You can see more information on our Brewery Tours page. If you would like to climb aboard and go tour the breweries contact us now! 4 breweries in 5 hours. Meet at the valet parking of The Oxford Hotel. Convenient parking in the parking garage. Take time for you to have lunch at one of the breweries. It’s a great way to see Bend!